E-Breast is a technology calculates the strain ratio between the selected target and surrounding fatty tissues. E-Breast requires one ROI to be selected by the user. This simplified process enhances consistency and reduces the chance of error by eliminating the step of manual selection. 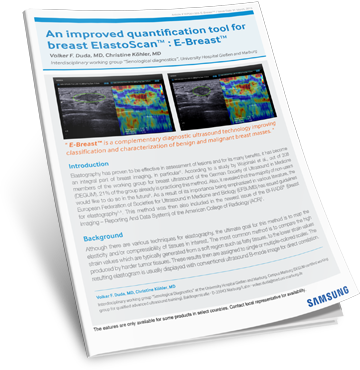 The elastographic examinations presented in this white paper were performed using E-Breast which is available on Samsung’s RS80A and WS80A ultrasound systems.